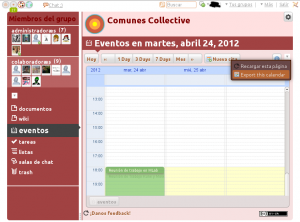 We’ve updated kune.cc and the Kune demo with some improvements such as the calendar/events functionalities. Now we can export each group’s calendar to other calendar apps that you can use in your mobile, Thunderbird, Google Calendar, or similar apps. If you think about it, you may say “Well, it’s something more or less common”… but remember, all these events are groups events (a collaborative agenda) that can be updated in real time by several people (same as Google Docs), and can be decentralized (same as email). It’s not a simple static email or post with an event. Remember that typically, the group decides on an event, and each individual must be notified to update their individual agendas with the event. In Kune, this would be done automatically in the moment a group member posts the event. This can help a lot in the mobilization of groups because in the end, they tend to use email, Twitter, Facebook, etc to do so, and well, it doesn’t work very well. This feature facilitates the building of common agendas and avoid repeating efforts. Make the current code more scalable (improve the cache of events). Improve the user calendar (with all its personal and groups events) with follow/unfollow of events. Develop more the private/public events visibility and permissions. Create new event gadgets. Now our main event gadget (massmob) has been improved a lot, but we can develop/adapt other event capable gadgets, like decentralized doodles, etc. Thus, we can keep moving towards a decentralized Google Calendar, Doodle, etc infrastructure. This entry was posted in Advances and tagged advances, agenda, calendar, events, improvements, update, usability. Bookmark the permalink.